Magic Duels giveaway! We’ve got 5 codes for in-game gold, worth $12, to give away! If you’ve always wanted to play Magic: The Gathering but avoided doing so for fear of bankruptcy, then Magic Duels may be for you. A free-to-play version of its physical cousin, Magic Duels is a faithful emulation of the real thing that doesn’t make you question your life choices when you find bits of cardboard in every nook of your flat. 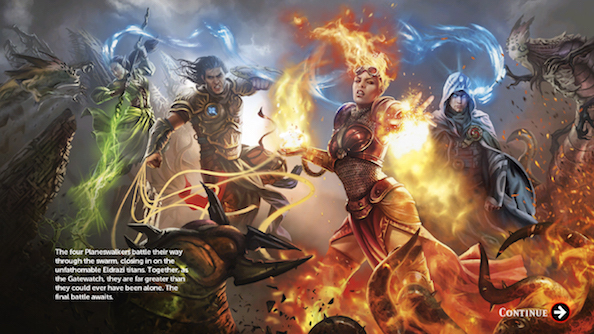 Magic Duels contains a full story campaign, focusing on the origins of the five main Planeswalkers, powerful beings inside the Magic: The Gathering universe that represent the game’s various card archetypes. Magic Duels contains various match modes; including Two-Headed Giant, solo battles against AI and versus mode against friends or random opponents online. As of today, Magic Duels will also be launching their newest story expansion, Shadows over Innistrad, which introduces to the game 300 new cards and the newest chapter in the Magic narrative. We’ve got 5 codes for Magic Duels to give away, each one granting 1,250 of in-game gold that can be spent on extra booster packs. For a chance to win, all you need to do is enter via our widget below. Every action you complete in the widget is worth one entry, and the more entries you have the higher the chance of winning. We’ll also need your email address so we can send you a code upon winning – no spam, we promise!